Description: Stem scandent, up to 30 cm wide, lobed to a slightly 2 edged midrib, the lobes 13-15 cm long, 4cm wide, upcurved at the outer end into tapering tips; areoles small, merely notch-like pits at the base of the upper side of the lobe, sometimes bearing; spines 2-3, usually lacking; epidermis light green, smooth. Flowers to 32 cm long, 20 cm wide, lower 1-2 cm portion of tepals decurrent; receptacle 2 cm long with strong podarias, bracteoles 3-7 mm, pale green and in their axils wool and 2-4 stiff bristles, 2-4 mm long; pericarpel 16 cm long, 11,25 cm thick, pale green on lower 7cm, upper portion stained dull rose-red, bracteoles on receptacle 8-12 mm long, green, the upper ones stained purplish; outer tepals 11-14 cm long, 8-10 mm wide, linear-lanceolate, acute, spreading, outermost series dull purplish rose, nest purplish on midrib, the nest brownish rose-margined; inner tepals 11-14 cm long, -20 mm wide, oblanceolate, abruptly mucronate, shallowly erose at apex, white; stamens 11 cm long, numerous, included, declinate, chrome yellow, attached in a descending series from the top of the throat to halfway down the receptacle, anthers slate-brown, 3 mm long, pollen cream; style 25 cm long, creamy white, 3,5 mm in Ø, stigma lobes 13, 15-20 mm long, subulate, cream colored. Fruit sphaerical, 7 cm thick, green; spines numerous, yellowish. 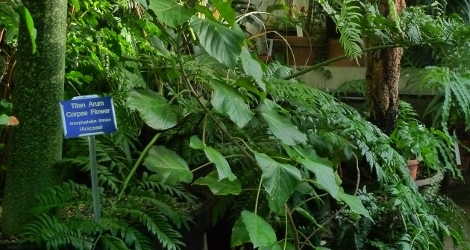 Culture: S. chrysocardium is a tricky species to cultivate unless in a tropical greenhouse. It is a fast growing species which can't stand cold situations. Needs a compost containing plenty of humus and sufficient moisture throughout the year. Give a suitable fertilizer during the growing season. Should not be kept under 15ºC (59ºF) in winter. Best grown in semi-shade. In Europe it flowers in the winter.